I’d seen this fantastic contemporary dance group before, so booked early when I saw they were going to be performing nearby the other evening. And I was not disappointed. The eleven male dancers performed a stunning programme: fast, athletic, acrobatic and imaginative. They started with ‘The title is in the text’, danced entirely on and around a giant seesaw. 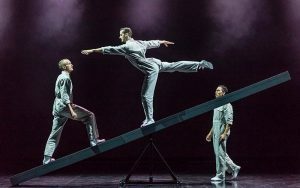 Balance was obviously key to this piece, and already the dancers appeared to have shed all their human weight, enabling them to appear to be almost flying. They rocked, see-sawed, slid, tipped and balanced. While the dance was fun and absorbing, the sound track for this piece was challenging and, as well as more conventional instruments, included rap and whispers. It was only when I read the programme when I got home that I discovered that one of the singing voices in this track was our friend Joanna Forbes L’Estrange. Trousers came off for the next piece, ‘Human Animal’, in which the dancers, clad in floral shirts and black underpants, started by walking round the stage pawing at the ground like horses, then performing other movements reminiscent of equestrian dressage. A male pas de deux entitled ‘Us’ came next, choreographed by Christopher Wheeldon, with music by Keaton Henson. In this piece, the two bodies clashed and entwined, attracted and affected each other, with every movement by one a catalyst for the other. The final piece in the first half was ‘The Indicator Line’, an exciting, energetic piece, with action answered by counter-action. For this piece, the men were dressed in work overalls and clogs, the latter being used to percussive effect. There was so much male energy, positive and negative in this piece, that I think we all felt at the end that we had been part of the action. For the second half of the programme, the company performed one long, breathtaking work, ‘Fallen’, choreographed by Russell Maliphant. This new work was possibly my favourite of the evening. It was not only impressively physical, but also beautiful, with the apparently weightless bodies appearing to defy gravity as they flew through the air, making not a sound when they landed. Quite apart from the sustained energy and extraordinary physical prowess of the dancers, the intellectual challenge of learning such complicated sequences and performing them seamlessly, is staggering. Having booked early, we had good seats, and I was a little surprised to see that some of the dancers were not as young as I had imagined. However, there was no lack of skill or stamina, so perhaps it’s the punishing schedule that keeps them young. They certainly gave the 600-700 strong audience an exciting and inspiring evening. As a final coup de grace, it was fascinating how, when the audience left the auditorium at the end of evening, most people seemed to be walking taller and more gracefully than when they came in.